Tablets are becoming more useful for getting real work done. 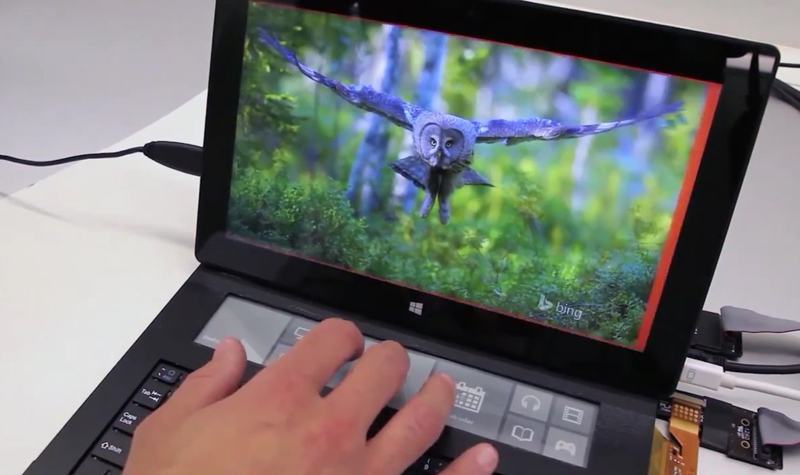 Looking to further bridge the gap between slate and laptop, Microsoft Applied Sciences built a prototype device it calls the DisplayCover: a keyboard cover that houses an e-ink touchscreen display. The 1,280 x 305 resolution panel not only provides access to app shortcuts, but it can also handle touch gestures for navigation and accept stylus input. The stylus feature seems to make things like signing documents and scribbling notes a breeze, based on the demo video. In the case of an app like Photoshop where you need constant access to tool palettes, those items can be parked at the top of the keyboard so they don't take up valuable space on the tablet's display (in this case a Surface). Why e-ink? Well, the team says the material was selected because it wouldn't put too much added strain on battery life like a full-color touch panel would. Sure, the DisplayCover is a prototype that's obviously far from finished. However, it's interesting to take a look at what companies are doing to make efficient use of small screen sizes for maximizing productivity.